Welcome to our guide to the blu PRO® Kit. On this page, you’ll find everything you need to understand and get the most out of your device. The blu PRO® has an optimised coil resistance which creates a smoother taste to give you a unique vaping experience. Your blu PRO® is shipped to you with a partial charge but we recommend that your device is fully charged before your first use. To get started, all you’ll need is your fully charged blu PRO® and your favourite blu® Liquid. 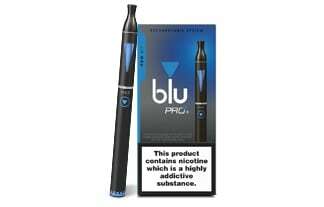 Your blu PRO® Kit is an Open System e-cigarette, meaning it needs to be refilled with e-liquid (a Closed System device, on the other hand, uses refills that are prefilled with e-liquid and packaged). Your rechargeable device will arrive partially charged so that you can get going straight away. All you have to do is fill and prime your blu PRO® Clearomiser before using it. How do I know when I need to charge my blu PRO®? The blu PRO® has indicator lights to help you monitor the remaining charge on the battery and an upgraded battery connection. This means it can be fully charged in just 3 hours and will last for longer than ever. When your blu PRO® Battery starts to run out of charge, you will start to notice a few changes in the way your blu PRO® is performing. This may include less vapour production and a less intense flavour. When you notice any of these things, this is a good time to prepare to recharge as your charge will soon be completely depleted. When your charge has depleted, the blu PRO® will stop producing vapour. How do I charge my blu PRO® Kit? Screw your blu PRO® Rechargeable Device into the USB Charger. Plug the USB Charger into a USB-compatible charging port. Once the device is fully charged, the light on the USB Charger will turn blue. *If the light does not glow when the USB Charger is plugged in, the device has not been screwed in correctly. Simply unscrew the battery from the charger and reconnect. Open the blu® Liquid bottle by pushing down on the cap and turning it to the left. Gently fill the clearomiser with blu® Liquid. Use the clear window to monitor the amount of blu® Liquid in the clearomiser. Do not overfill. Carefully replace the lid on the blu® Liquid and screw the mouthpiece back onto the clearomiser. Screw the clearomiser onto the battery. Before using, allow a few moments for the liquid to settle.